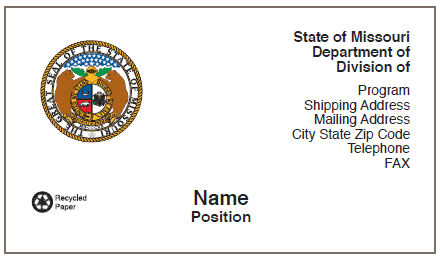 When requesting business cards from the State Printing Center, please use the State Printing Requisition or the Business Card Printing Requisition. It is suggested that multiple names be submitted on one printing requisition provided they are all the same quantity and type of card. They also must be billed to the same customer code number. When the printing requisition asks for No. of Pages, please type in the number of names being requested and in the Total # of Finished Pieces, type in the quantity of the card (i.e., 250, 500 or 1,000). Descriptions are not necessary as long as your request is coded according to the sample at right. For example: 500 of the 4-color card would be submitted as ‘1B’. 250 of the recycled card with the gold seal would be submitted as ‘2A’. Do not mix type and quantity on the same order. Our business cards follow a standard format. There are up to 10 lines allotted for the address portion of the card, one line for the name and one line for the title. Please attach actual printed samples or typewritten samples with corrections. Upon completion of typesetting, a proof will be provided to the customer for their review. Business cards will not be printed until the signed proof has been returned to the State Printing Center. 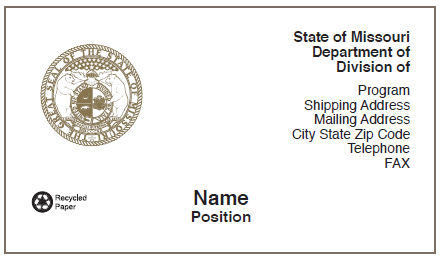 State Printing no longer prints business cards on virgin stock. All standard business cards are printed on recycled paper.